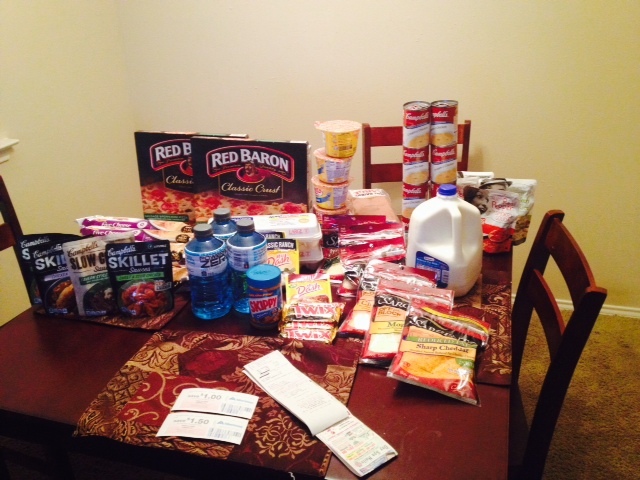 Frugal Follow: Couponing at Kroger! 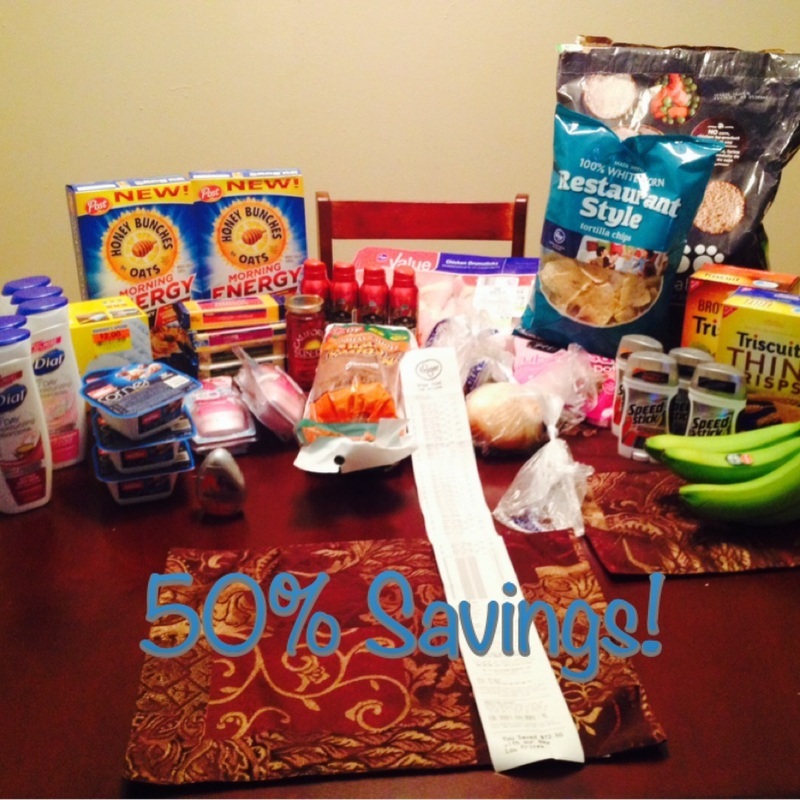 Frugal Follow: Couponing at Albertsons - 65% Savings! Follow Me Friday: Tom Thumb! Happy Valentine's Day, lovers! I have two loves in my life: my husband and coupons. Don't judge me. ;) Anyways, today I found tons of great deals at Tom Thumb this morning and took advantage of their $5 Friday sales. For a complete look at their ad, click here. My first find: FREE CAT FOOD! I don't have cats but my mom has two cats, which she claims are mine but I know she loves them too. You can currently print this coupon here and search Iams and voila! Since these coupons exceed the retail price, I bought more than just 9 cans so it will scan through. Pay $0.30 for 14 can of cat food - That's $0.02 per can! I found these "peelies" on boxes of Minute Brown Rice boxes! There are also other coupons that are from inserts (use the coupon database here or internet printables). 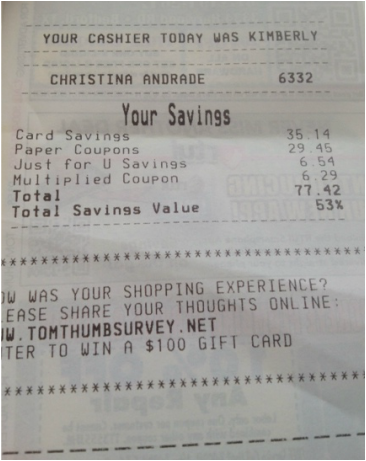 Tom Thumb doubles one "like" coupon up to $0.50. So these bad boys were only $0.09 for two cans after the coupon! Calling tuna lovers! This $1/2 Starkist coupon is from SS 01/05/14 insert. That makes each pouch $0.35 each after the BOGO sale and coupon! Finally found a good deal on these marinade infusers from French's! After the coupon, they were only $0.50 each and these retail for almost $4! This ad matchup is for the DFW area (Colleyville, TX). Albertson's doubles four like coupons that are up to $0.50 and triples coupons that are up to $0.35. View the full ad here. Seems like a slow week at Albertsons. :( Thanks for reading and feel free to leave a question/comment!! In need of laundry detergent? 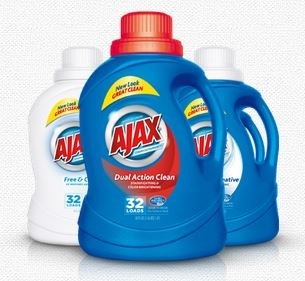 Walmart currently has Ajax Laundry Detergent 32 loads for $2.50 each. Combine the deal with this coupon for $2.50/2 internet printable and score Ajax Laundry Detergent for $1.25 each when you purchase two bottles! Hiya everyone! Here is another quick guide to shopping at another favorite store of mine. Kroger! 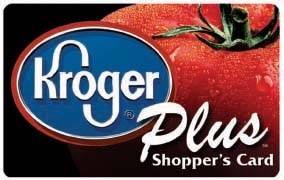 Kroger has a posted their coupon policy online. Unfortunately, they do not double or triple coupons anymore. However, their Kroger Rewards card has an awesome selection of digital coupons. (Digital and paper coupons may not be used on the same item since they are both forms of manufacturer coupons). Final cost: $0.99 - That is a HOT deal! So not too bad of a week at Kroger. A lot of their items are 10 for $10! Please let me know if you see a math error or if I missed something. Thanks again for reading and happy shopping!! Each Albertsons has their own coupon policy so be sure to call and speak to a manager as they are more likely to fully understand their coupon policy. Here are some coupon match ups for the sale starting 1/15/14 for the Colleyville location: View the full ad here! If you see a math error, please let me know! Thanks for reading and I hope this helps you out on your next shopping trip!! Calling all people who use toothpaste, razors, shave gel, etc!!! You need to stop buying these expensive items in the grocery store and start using CVS ExtraCare Bucks program to score seriously inexpensive toiletries, medicine, and cleaning products. This post will help guide you into shopping at CVS and how to play the CVS game. What is their sale cycle? Their sale cycle renews every Sunday and their new sales ad comes out in the week's Sunday newspaper, usually next to coupons! Also, visit CVS.com to look at their ad online. What are Extra Care Bucks (ECBs) and how do you earn them? In order to obtain Extra Care Bucks, you will need to sign up for an Extra Care Rewards Program card.Once you have done that, you can start earning. Extra Care Bucks are like cash that can only be used at CVS. You earn them when you purchase an item that will generate an ECB. Once you have purchased the item and you finalize the transaction, your ECBs will print at the end of your receipt. Also, ECB deals will be printed in the weekly sales ad as well. How to effectively use your earned Extra Care Bucks. To maximize your savings and pay as little out of pocket as possible, you will need to learn how to ROLL Extra Care Bucks. Roll: purchase new Extra Care Buck deals on a regular basis while rolling Extra Care Bucks earned from previous weeks to purchase them. Eventually, you will be paying as little as nothing out of pocket! Get back $1.00 ECB to put towards your NEXT transaction. So essentially, you would be getting St. Joseph Aspirin 36 ct. for $1.00. BUT! To make this deal even sweeter, you add a coupon. Making this aspirin essentially FREE! So each week, usually Saturday night, I will post my game plan for Sunday's CVS trip. The more ExtraCare Bucks you earn, the lower your out of pocket expense will be. When you first start to shop at CVS, be on the lookout for great deals that generate ExtraCare Bucks so you can start to roll them every week. Please let me know if you have any questions! I started off the week with $25 ECBs. (This is why it so important to start earning as soon as you can!) The majority of CVS promotions are always "Spend $$, get $$ ECBs". CVS has a rule where if you spend 98% of the qualifying amount, they will still grant you ECBs. For example: Spend $25 on Schick items, get $10 ECBs. If I only spend $24.58, they will still grant the ECBs even though I am a little under the $25. Minus $3.99 from BOGO coupon and minus $1 from internet coupon = $9.98. The CVS promotion offers $5 ECBs if you spend $15 on Windex products. Since I spent $14.97 (they will still grant your ECBs even though I'm $0.03 shy) I earned $5 ECBs. 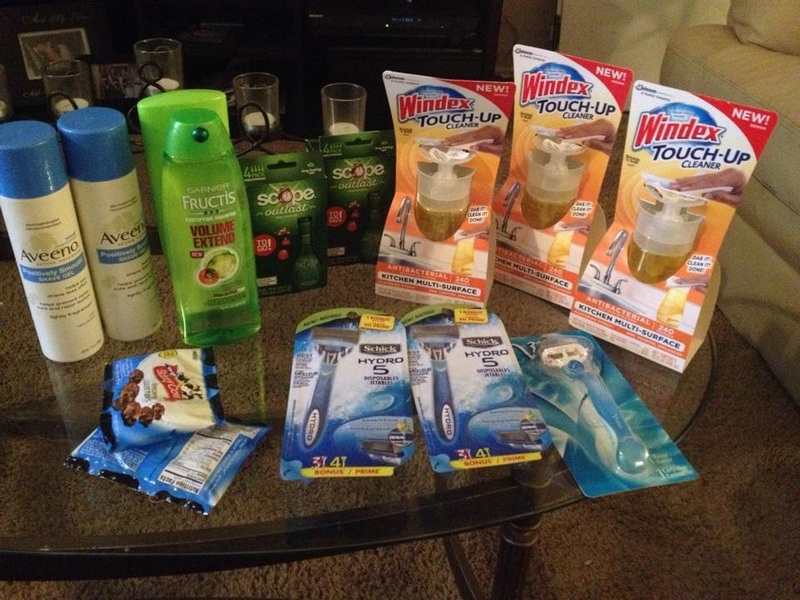 CVS promotion: Spend $25 on Schick products, get $10 ECBs. Every Thursday, CVS will email a CVS coupon. This week, I received a 20% off my entire purchase coupon. CVS coupons are not manufacturer coupons, so you can "stack" these coupons together! This CVS coupon deducted $9.54. Remember, I had $25 ECBs from the week before. So this transaction cost me absolutely nothing out of my pocket. In this transaction, I earned $20 ECBs. Used $10 ECBs from first transaction. Paid $1.73 (tax) out of pocket. Earned $9.79 in ECBs. I will have a total of $19.79 in ECBs for next week's deals. Whew! There is a lot of math dealing with coupons and deals. However, I believe it is totally worth it. So every Saturday, I'll type up my game plan. Every Sunday, I'll share with you all the deals I purchased. Thank you so much for following along and ask any questions in the comments!! Hello everyone! So my first post will be very basic information about coupons. I hope this blog will help guide you into how to save money on your grocery bills, along with drugstore deals! What is "couponing" and why do it? Couponing is the act of matching store sales along with coupons to bring your out of pocket expense as low as possible. Once the item is at the lowest price possible, it is advised to buy multiple quantities of that item (stock up). Sunday Newspaper: I prefer the Fort Worth Star Telegram. I buy my newspapers at my local Krogers. They sell a bundle of two newspapers for $3. I buy two bundles, therefore giving me four newspapers resulting in having four copies of each coupon in that newspaper. Inside each newspaper, there will be coupon inserts/magazines. The inserts are named SmartSource (SS), Red Plum (RP), or Proctor & Gamble (P&G). The P&G insert usually only comes once at the end of every month. I like to visit Sunday Coupon Preview to see how many inserts I should be expecting and what kind of coupons will be included. Internet Printable Coupons: This is the easiest way of starting your coupon collection or if you're low on time. By visiting Coupons.com, Red Plum, and SmartSource, you will have to download a coupon printer file which will allow you to print two "like" coupons. YOU CANNOT PHOTOCOPY COUPONS. This constitutes coupon fraud and the coupon police will come knocking at your door!! Just kidding. But seriously don't. Each printed coupon has it's own unique code. You can however print from different computers! Also, be sure to "like" your favorite brands on Facebook as companies frequently send awesome coupons through their Facebook page. Inside products or on the packaging: This type of coupon is also known as a "peelie" since you peel the coupon off the package and use it. 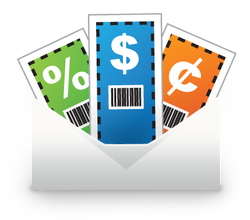 Digital Coupons: These coupons are loaded onto your grocery store loyalty card. Pick one or two stores and get comfortable with that store's coupon policy. Each grocery store is unique. If available, access the store's coupon policy and print it out to bring with you just in case a problem with a cashier arises. Join their loyalty card program, if applicable. I mainly shop at Albertson's and occasionally visit Kroger or Tom Thumb. Drug stores are a completely different ball park. My next post will be how to save at CVS. 2. Collect and organize coupons. Stay organized! This is probably the most important rule in couponing. I use a binder but find whatever best works for you. Every Sunday, before adding new coupons to my binder, I will throw away any expired coupons. This ensures that all my coupons are valid and there won't be any wasted space within the binder. Only cut coupons you know your family will use. Also, keep in mind if you can get the items for free, think if it could be donated. In my coupon binder, I organize my sections by: General, Fridge, Freezer, Cleaning, Beauty, Medicine, Pets, Household, Misc, Restaurants, Beverages, Snacks/Candy. Beginning to coupon can be very informative as it is A LOT of information to take in. I look at using coupons as a fun hobby that saves me tons of money. Keep in mind that savings can take time because it takes time to collect coupons. Don't expect to spend $5 on $100 grocery bill. This site is to show you how to get amazing savings, not how to buy 97 tubes of toothpaste for free. (Even though I do have like 20 tubes under my sink, but don't judge me!) My next couple of posts will be about how to save at specific stores. Please leave a question if you're confused about anything! Thank you so much for reading and I am so excited about showing you how to save money for you and your family. Hi! My name is Christina Andrade. I'm a full time student looking for the most bang for my buck! I hope to show you how to use coupons effectively and save the most money.